This title is an homage to my icon, Joan Didion. Her latest publication, South and West: From a Notebook (2017), is not only telling of Didion’s voice and perspective; it is an open and unfinished glance at what writer’s notice when traveling. Since I like to consider myself a writer, it’s entertaining to imagine someone paying money to read my travel journal–lucky for you, this blog is free! Ever since I first encountered her work, Didion has heightened my awareness of setting, of environment. She focused heavily on California, often characterizing her experiences on the West Coast relative to those from her time spent in New York. She grappled with the allure of the West that inevitably “cannot hold”, was disenchanted by the East. A resident of the North but student in the South, I relate. Straddling regions like so can be equally refreshing and exhausting. So, as the token terrier of my friends who hails from north of the Mason-Dixon line, I feel I have the liberty to say the following: Yankees just aren’t as nice as Southerners. While I am proud to be from Pennsylvania, and growing up I always felt like my hometown was characterized by welcoming and generous towns-persons, moving to Wofford and spending time in the South revealed a world of southern hospitality (and chicken and dumplings) I never knew existed. It’s as real as the next social phenomenon, in my mind. Not so surprisingly, Chile presents a similar dichotomy—or so the Chileans are convinced. Located in central Chile on the coast, “my” city of Valparaíso is less than two hours from capital of Santiago; from there, one can find a bus or plane to the northern and southern ends of Chile. The nation’s incredible length but pencil-like width inhibits full accessibility, however. The country crumbles southwardly into an ice maze once navigated by Magellan and his contemporaries. Along the eastern border with Argentina, the Andes climb up from Patagonia towards the Atacama desert characterized by towering volcanoes, salt flats, flamingo reserves, and the world’s highest (by altitude) geysers. Mines and their accompanying towns are scattered along the interior. Geographically and physically distant, these disparate worlds of Chile’s extreme ends would logically produce disparate cultures. As I said, the Chileans really believe just that. For the most-celebrated Chilean holiday of the year, university students were granted a full week of vacation. My friends and I decided to take our 10 days and venture to just one of these geographic extremes. We flew north. Two buses, a plane ride, and two rented cars later, we reached the tourist center of San Pedro de Atacama to collect maps of the region. One of the first stops we made was at a travel agency which specializes in day trips to the nearby salt flats and flamingo reservations. Tackling logistics in Spanish was just part of the fun! We tried to discern where we would find free campsites (adventuring on a budget) but soon learned that would be harder than anticipated. Any of the following quotes throughout the remainder of this article are roughly translated yet relatively direct, taken from my notes in the corresponding evening’s journal entry (again, lucky for you, I’m not Joan Didion and my travel notes wont’ cost you a penny). We took her advice with a grain of salt—or rather, millions. That night we drove out of San Pedro and away from Moon Valley towards the famous Salar de Atacama, or salt flats of Atacama. While it was dark and challenging to discern what exactly our surroundings were, we found a dirt road off the main highway suitable for “free camping”, feeling assured by the sprinkling of campsites we made out in the glare of our headlights flashing off the reflective material of other free campers’ tents. The next morning we rose with the sun. We were stunned to realize we had camped but a kilometer from the entrance of the salt flats. It was at this park that I first began to discount all the negative discourse I had heard about northern Chileans; the park staff saw my friends and I with dishes in hand and offered to take us to the building’s sink and use their soap and sponges to clean our pots from that morning’s oatmeal. When you’re camping in the world’s driest, non-polar desert for several days, water is a precious resource, so using the park’s sink meant we could save our bottle water for thermoses of hot tea later that night after we climbed to 14,000 feet towards the world’s highest geysers at Tatio. Everywhere we went we encountered acts of kindness, generosity, and hospitality from the supposedly-unfriendly Northerners. On the day of Dieciocho, Spanish for “18” but indicating the celebration of Chile’s independence from Spain, locals helped guide us to the center of the festivities located on the outskirts of San Pedro. When we left town for good the next day to find the supermarkets in Calama were still closed—leaving us unable to restock on food for the second half of our trip driving down the coast—locals in the city of Calama pointed us towards small corner stores to find the basics. The night of September 19 we reached a town on the coast known as a popular beach camping site. Our compact cars had handled a range of terrain, but we did manage to get stuck in a pocket of loose sand. The next morning a Chilean couple drove by in a truck and immediately stopped to help pull us out. I talked with the woman while her husband freed our car; immediately she instructed—not invited—us to pack up our campsite and move down the beach next to theirs. The greatest blessing? The usual Dieciocho celebration is accompanied by an asado, or cook out. Our new neighbors fed us copious amounts of juicy chicken, pork, steak, and chorizo. We built a bonfire together, us 7 American college students and the Chilean family of 4. Faces warmed by the flames, we entered another conversation about the Northern/Southern divide in Chile. This family asked us if we thought Northerners were unwelcoming—this question after pulling our car out of the sand, feeding us, and sharing their vacation time with us. It strikes me that Chileans are so convinced of this stereotype, so much so that they are blind to their own generosity. 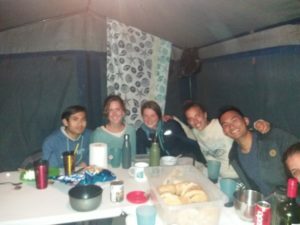 A blurry but memorable photo inside the tent of our Chilean family we met on the beach! The next morning the mother insisted we also join her, her husband, and two teenage sons for scrambled eggs, bread, and coffee. We even had condensed milk for our coffee, a luxury after days of Nescafé brewed in lukewarm water boiled on a camp stove. 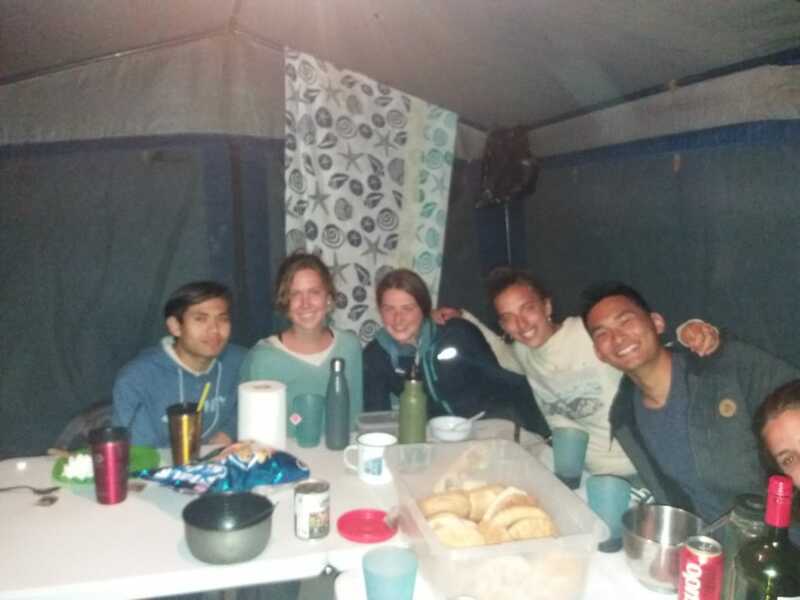 To show our thanks, we helped them break down their camp and washed the dishes (the night before we offered our wine, eggs, bread, and tomatoes we bought in Calama, but when they were packing their car, we were gifted all that back plus their leftovers). After they left, our former neighbors from our first night on the beach, who also helped us break free from the sand, drove by to gift us their leftover bread, wine, grilled chorizo, eggs, tomatoes, and firewood (can you tell what the Chilean staples are?). After encountering closed grocery stores in Calama, this bounty and hospitality from our beach friends convinced us that everyone, including the Northerners themselves, are absolutely wrong about the politeness divide in Chile. This phenomenon might have only stood out to me because of my heightened awareness of regional differences as a woman from north of the Mason-Dixon Line studying in upstate South Carolina. Or maybe it suggests that our perception of our own nations’ regions is not all that different from Chile, and possibly other countries too. I don’t mean to discount any of Ms. Didion’s intricately-noted observations from her American road-trip in the south, but I do challenge her to consider how we perpetuate stereotypes within our own nations. To conclude our adventure throughout northern Chile, the group drove north up the coast towards the city of Iquique. We savored the fresh ceviche and magnificent sunsets which painted the waves orange as they crashed against the basaltic rocks. At one of the mercados, or markets, we found some souvenirs. I paid for my traditional Iquique candy and spoke with the gentleman for a few minutes then left. A moment or two later he tapped me on the shoulder and handed me a bean and another coffee-flavored candy. “For luck and good travels,” he told me. P.S. This weekend I’m headed to Santiago for some interviews with artists so I look forward to sharing about that soon, too. Que les vayan bien!